Shankar Mahadevan Academy is working to bring the works of great artists and their rare compositions to the world. Often, these gems of creation get lost in time and forgotten. 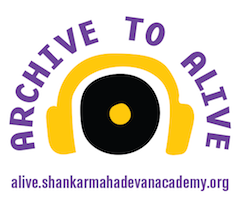 The Archive to Alive project, not only allows a way to archive these great works of art but also provides them to the public to listen and learn. Students can sign up to learn these songs as a self-study course material for free or learn them with an instructor for a fee. Naman Sajan Piya is a tribute to the rich legacy of Padmabhushan Ustad Khadim Hussain Khan. Created by Vidushi Lalith J Rao and her students in the memory of Ustad Khadim Hussain Khan and to preserve compositions from the Agra Gharana. This compendium consists of compositions faithfully and beautifully rendered by the disciples, along with excerpts of live recordings of a few of the compositions performed by Lalith J Rao herself in public concerts.